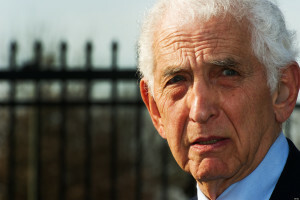 Employed by the RAND Corporation “think tank” as a military analyst during the Vietnam era, Ellsberg was one of the authors of a top secret study commissioned by President Lyndon Johnson’s secretary of defense, Robert McNamara, analyzing the process and circumstances by which the United States became involved in the Vietnam War. Ellsberg turned against the war and in 1971 leaked the top-secret study to the New York Times. The so-called “Pentagon Papers” revealed the Vietnam War to have been the product of official deceit and deception, combined with tragic miscalculation and misjudgment, during the administrations of four American presidents. The document galvanized the antiwar movement and caused many Americans to lose their trust in the integrity of government.